Every year since The Bee was born we have made a handprint ornament of some type for each one of the grandparents. I love these ornaments, looking back each year at the past ornaments and seeing how much the girls hands have grown is one of my favorite parts of the holidays. In the past I have really been the one who made the ornaments but this year I wanted to involve the girls (at least the Bee) in making them. My favorite projects are always the ones that everyone can do and this was a good one for both the toddler and preschooler. 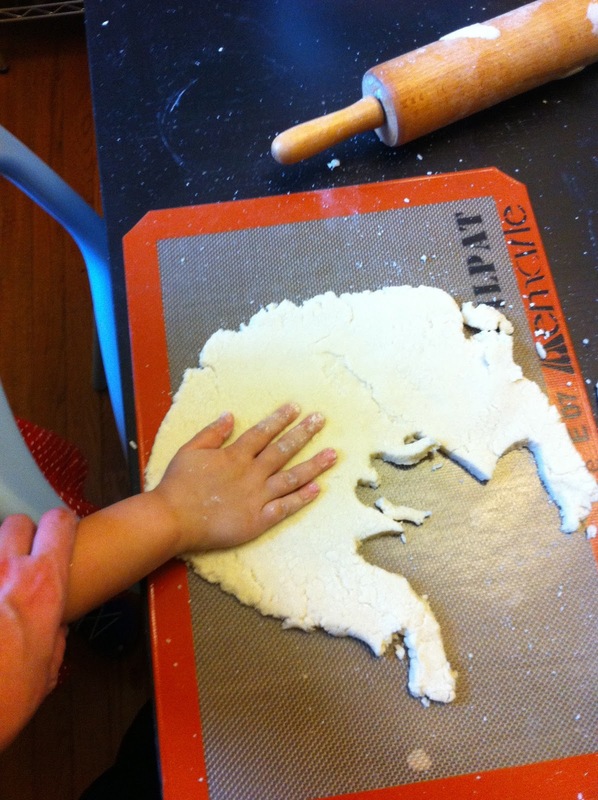 We used salt dough to make our ornaments and both The Bee and Bean had a blast playing with the dough. This was our first salt dough experience and I was pleasently surprised by how easy it was to make. We used a recipe I found on All Recipes but the recipe is very simple, four cups of flour, one cup of salt and enough water to form a dough. The Bee helped me mix up the dough. I then gave some to the girls to play with while I traced their hands onto a rolled out piece of dough. They also cut out a few ornaments with cookie cutters. 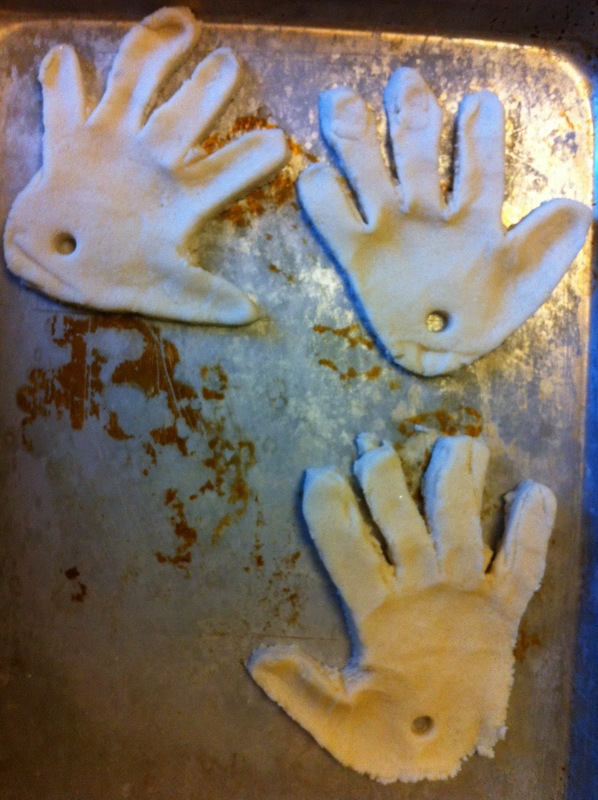 We put the hands and cut out ornaments on a cookie sheet and baked them in a 350 degree oven for over an hour. Since our ornaments were on the thicker side I flipped them half way through. When they were done and cooled, The Bee painted them with a glitter acrylic paint, which she selected and loved. The acrylics worked great on the salt dough and while we had to be a little extra careful with them, The Bee handled the challenge well. 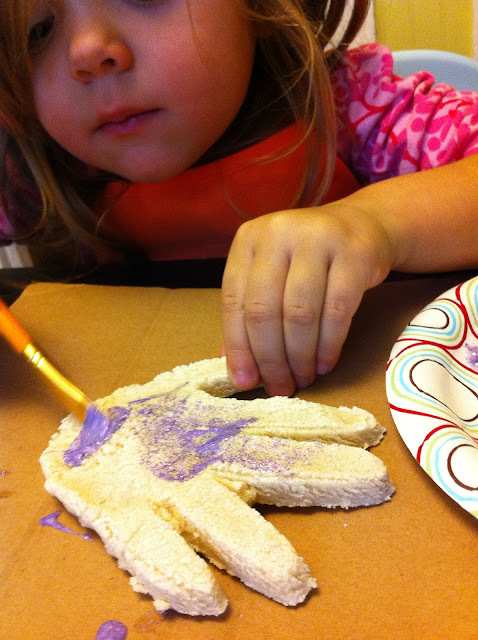 Before baking we made holes in the hands using straws and will thread a ribbon through them before we wrap them up. p.s. if any of our grandparents happen to be reading this, just act surprised okay?